HAITI clipped Trinidad and Tobago 1-0 in a keen match to open their account for a second Caribbean Football Union's (CFU) Championship in Paramaribo yesterday. Jean Joseph Mathelier converted the winning goal in the 87th minute as both teams gave a fine performance on a wet and slippery ground. In a match in which the teams failed to capitalise on several chances, the Haitian goalkeeper Michael Maurice thrilled an estimated 5,000 spectators with a splendid performance. 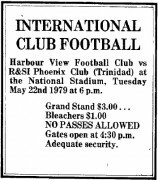 Suriname, the Caribbean champions and holder of the Duvalier Cup — the award for winning the Nations Cup — will play St. Vincent tonight in their opening fixture. • Haiti versus St. Vincent — Wednesday. • Trinidad and Tobago versus Suriname — Thursday. • Trinidad and Tobago versus St. Vincent — Saturday. • Suriname versus Haiti — Sunday.